Below are images of a different version of the rayon chenille scarf I wove, this time using black and variegated colors. 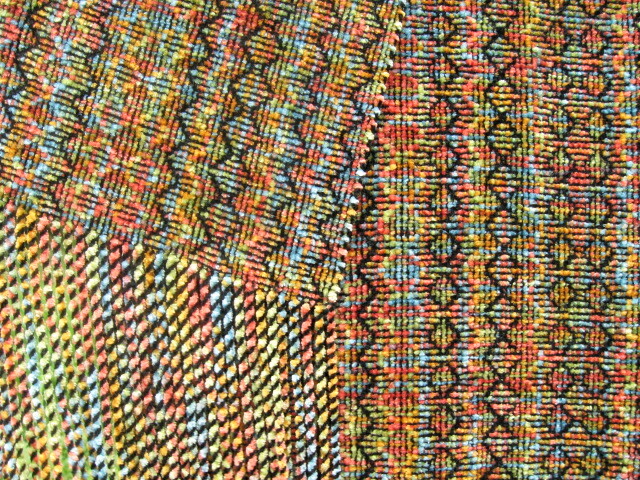 To view images of the other similar scarf, the weaving draft and notes on finishing techniques click on Shadow Weave #4 (& my experience weaving with chenille). The more you weave with chenille and discover what works best for you, all the effort is worth it in the end! This entry was posted on May 29, 2009 at 3:51 pm and is filed under Color-and-Weave, Shadow Weave. You can subscribe via RSS 2.0 feed to this post's comments. I love the colors in your scarf. THey turned out really pretty in the shadow weave pattern. Great Job! 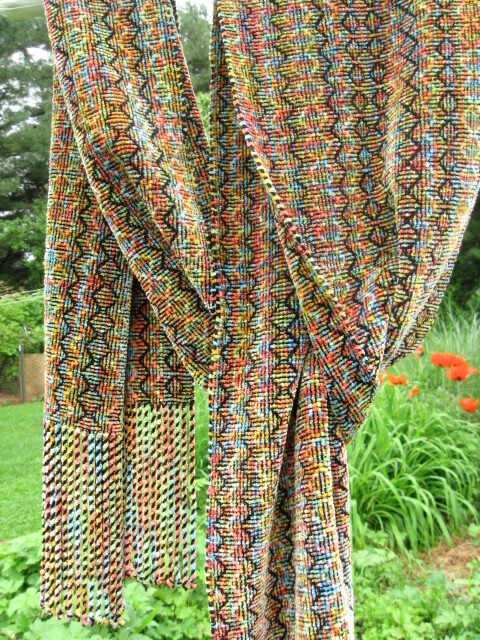 Great job – i would not have thought of using varigated yarn for a shadow weave. So happy to see your results. It’s fabulous. Isn’t your fringe fun? Love the black stripe in it! Thank you Mary! The fringe is a lot of fun! I should mention that in this scarf the variegated chenille is 1300 ypp while the black is 2500 ypp (much thinner) and I used the same sett of 18 epi as the other shadow weave #4 scarf. The feel of the finished fabric is not as plush and thick as the other scarf. Also, the fringes were more tricky to twist because I twisted 2 blacks with 2 variegated and the difference in thickness made it more difficult to twist well. What beautiful, sunny, colors! I have used variegated chenille a lot but never thought to use it in a shadow weave either. Nice work!